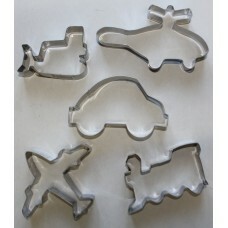 Complement your birthday party with decorated cookie or biscuits in the shape of planes, trains, bulldozers or cars. This 5 piece stainless steel cookie cutter set contains a Train (9cm W x 5.5cm L), Car (11cm W x 6cm L), Plane (10cm W x 9cm L), Bulldozer (8cm W x 6cm L) and Helicopter (13cm W x 7cm L). Non Rust. Includes a basic cookie recipe to use with your cookie cutters. Little boys all love big boys toys and this will be no exception. Bake delicious home made biscuits ..